We had meetings over in Chancery Lane where someone mentioned they had prosecco on tap in the pub. It would be rude not too...the pizza's here were also incredible, I would highly recommend the aubergine one. Believe the hype. This is one of the best cups of coffee you will have in London. My monthly visit to Flat Iron was as amazing as ever. The queue was 2 hours but it's worth every second for that creamed spinach and chip shop chips. As you know I am the biggest fan of breakfast and tend to eat it for most of my meals. I love how easy it is to whip up the most delicious plate in less than 15 mins. I visited Paris and had the most amazing time. Read about it here. I was taking a stroll through Covent Garden one evening and stumbled across this beauty. The chocolatiers were decorating it in the street and it was incredible to watch. Roll on Easter! I discovered this gem in Peckham Rye. Strong, delicious coffee and a cracking brunch menu. As much as I love London, I adore coming home and heading to the beach. This is one of the best spots for people watching and having coffee and cake. You can find this little gem in Seven Dials, it's just down the road from Monmouth Coffee so you can grab a coffee and doughnut and explore the gorgeous cobbled streets. 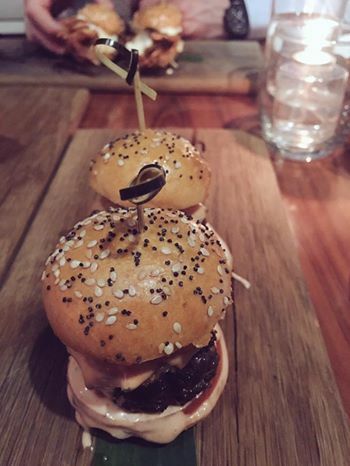 The fanciest of date nights are had at STK. The place is oozing with coolness from the dimmed pink lighting to the best mini burgers you will ever experience. Read about it here. The weather is getting warmer and I am in search of the best London rooftop bars and beer gardens, Tweet me your recommendations!